We all know that birds migrate every autumn in a predictable way, but every fall we learn new things about migration, and every fall birds do unpredictable things. The most exciting part of being a scientist is learning things no one ever knew before. People have been watching and studying birds for thousands of years, yet there is a lot still waiting to be discovered. This week two scientists who correspond with Journey South made new discoveries. 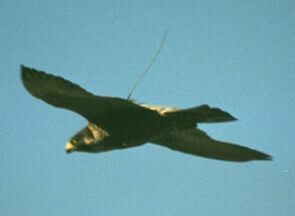 One follows a Peregrine Falcon via satellite to learn more precisely how Peregrines migrate. The other is collecting data from oil platforms on the Gulf. People on the platforms have been noticing birds for decades but it's only been recently that ornithologists started collecting data there. Read Geoff Holroyd's report below. Make a map of the course this falcon has traveled so far. Then answer Challenge Question #8: "How many miles has peregrine #5735 travelled?" To respond to this question please follow the instructions at the end of this report. Geoff Holroyd writes, "On July 6, I and Jeff Dixon, senior warden, Wood Buffalo National Park, caught the female peregrine at her nest near Fort Chipewyan in northeastern Alberta. The falcon had 3 healthy young even though she was only one year old. 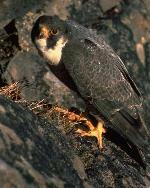 Often peregrines do not nest until they are at least 2 years old. We could tell her age since one year old peregrines have a brown feathers on their back. By year two their back is slaty blue. "By mid September, the female was making flights away from her nest site but returned daily. On September 17 she flew 63 km east to the south shore of Lake Athabasca. Oct. 8--Pine Islands, east of Key West. Oct. 11--north coast of Cuba. She was at the same location on October 14." When she stayed there for three days and seemed to be settling it, Geoff figured she must be overwintering there. She reminded him of the falcon they followed last year that "traveled south very rapidly and stopped abruptly south of Veracruz, Mexico. It remained there for the winter." As a scientist, it is Geoff's job to make predictions and test them. Geoff predicted that this year's marked Peregrine would remain in northern Cuba. But she didn't! On October 17, Peregrine Falcon #5735 had moved 535 km southeast, and was roosting in the foothills of Sierra Maestra 30 km west of Santiago de Cuba. Then, "during the night of September 20/21, she roosted on the south coast of Haiti, immediately south of Port-au-Prince. She is about 400 km southeast of her location on September 17 on the south coast of Cuba." Geoff wonders if she will continue southeast and fly over the Caribbean Sea to South America, or if she'll follow the island chain east to the Leeward and Windward Islands. He promises to keep us up to date on where she goes from there. Location of the 5 oil platforms where scientists are based in Gulf of Mexico. Bob Russell, Journey South's correspondent from an oil platform on the Gulf of Mexico, had lots of news for us this week, now that he's back on the platform after all that "tropical weather mayhem ended." Bob told Journey North, "It's been literally a Peregrine cafe out here this fall. They have been common at all platforms, and our farthest platform has had up to 18 Peregrines roosting on it at a given time. Their favorite food seems to be Least Bitterns, Purple Gallinules, Green Herons, and Soras, though we rarely see these species on the platforms." 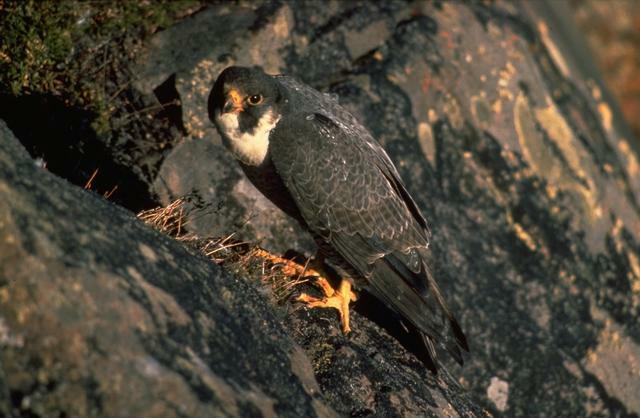 How do Peregrines find birds that the biologists don't? Bob explains, "The eyesight of Peregrines must be phenomenal: sometimes a Peregrine will see a migrant over the water, and fly out so far that I can barely see the Peregrine with 10X binoculars; then the falcon will fly back with its prey." Many scientists assume that Peregrine Falcons do all their hunting in the daytime, but Bob mentioned, "Much hunting is done at night during the active passage of migrants aloft. The presence of the platforms offshore has clearly had a profound influence on migrating Peregrines." Bob has been too busy with his data collection to have time to write about all the migration events he's seen this fall, but he did put together a vivid account of a thrilling migration night on September 15. Bob told us that not only are the scientists seeing birds moving south, they also see, and find on radar, birds moving north! "These northbound movements begin at first light, and they continue through morning and even into the afternoon. Our platform-based work indicates that these return movements are composed primarily of shorter-distance migrants that spend the winter along the Gulf Coast, and which accidentally "overshot" the coastline during the previous night and are attempting to make it back to land." Bob notes that although birds overshoot their destination on land as well as over the Gulf, they are easier to study from the oil platforms. Why do you suppose that is? Bob adds, "The commonest birds recently (well, before the latest period of extended SE winds) have been Marsh Wrens and House Wrens," and he and his team have seen a host of other short-distance migrants. He says, "Platform usage by these 'overshoot migrants' has been heavy, and because of the abundance of migratory moths and other insects offshore during the fall, these birds are usually able to feed successfully. The existence of a network of platform rest stops on which the overshoot migrants can stop and grab a moth snack is very clearly beneficial to these birds!" Speaking of insects, Bob notes, "We finally started to see a few Monarch Butterflies--but only a few. Gulf Fritillaries have been most common." They've seen lots of other butterflies out on the platforms, including "Painted Lady, American Painted Lady, Red Admiral, Buckeye, Question Mark, CloudlessSulphur, Little Sulphur, Ocola Skipper, and Many-banded Dagger Wing." Bob adds, "In the moth department, we saw massive offshore movements of several species of hawkmoths (also called sphingid moths or sphinx moths) during the Oct 7-12 post-frontal period. Pink-spotted Hawkmoths have been most abundant, followed by Tersa Sphinx and Mournful Sphinx, plus a few vagrant Esso Sphinx." And to provide further food for birds, "Dragonflies continue in force: Green Darners, Wandering Gliders, Spot-winged Gliders, and Black-mantled Saddlebags have been joined by Red-mantled Saddlebags and a few Marl Pennants." Can you find any of these insects in a field guide? Which ones can be found where you live? Last week we asked why Dave Evans marks owl flight feathers with a permanent marker, and how long these markings last. Second Grader Paul Mowery, in Nicole Long's class in Clarinda, Iowa, said, "I think that they use permanent markers so the markings won't wash off when rain falls." Permanent markers can last through rain and even sunlight as long as the feathers last. But hawks lose their flying feathers one by one, growing a complete new set roughly every year so the feathers will always be strong. Beth & Lorraine Colford-Feckter do a great job of explaining. "He marks the wing feathers to help in aging the owl the next time it is caught. If the saw-whet owls molt their wing feathers in a certain order and the bird is caught again, they will be able to tell how old it is. The permanent marker lasts until the owl molts the feather." 3.In the body of the message, answer the Challenge Question. Copyright 1998 Journey North. All Rights Reserved.